Raw fish are eaten all over the world. However, when preparing fish fillet for a meal, one might come across some parasitic worms, much to some people's shock and revulsion. Most of these parasitic worms are anisakid nematodes, and these parasites had other plans for that fish before they ended up on someone's chopping board. Anisakids is a family of parasitic nematodes which really gets around. It is found in oceans all around the world and they have complex lifecycles that carry them across most part of the oceanic food web, infecting all kinds of marine animals from krill to fish to whales. The larval stages of the parasite are found in crustaceans, squid, and fish, while sexually-mature adult worms live in the gut marine mammals such as whales and seals where they mate, and produce prodigious number of eggs which are released into the ocean to start the lifecycle again. Sometime humans can interrupt this cycle, resulting in a disease call anisakiasis. While the larval worms are usually found in the gut of their fish host, after their host dies, the worm tend to migrate into the muscle, where they are sometimes found by people preparing fish fillets for a meal. Since its lifecycle takes place in the open sea, anisakids have incorporated many marine animals into acting as their hosts at various stages of their development. One seemingly unlikely animal that they have incorporated is the hagfish. Hagfish themselves are often mistakenly consider as a parasite when they are in fact mostly scavengers. This misconception has probably arisen from their habit of burrowing into the body cavity of dead and dying fish while feeding, however unlike the other living lineage of jawless fish - the lamprey - hagfish do not exhibit any parasitic habits. Hagfish are also well-known as living slime machines, able to produce buckets worth of slime that act as a deterrent to many would-be predators. But despite their slime defence, this does not stop them from being eaten by a variety of large marine animals as well - some of which happens to be the final host for anisakid nematodes. Of course hagfish have also been incorporated into culinary dishes from around the world, which means they can also be a potential source of anisakiasis. In the study being featured today, scientists examined 265 hagfish purchased from a fishing port in northeastern Taiwan, composing of four different species. From that sample they were able to find eight species of anisakids. By far the most common species was one call Anisakis pegreffii, which made up about 80% of the worms that were found. And not all the hagfish were equally parasitised - the host with the most was Eptatretus burgeri, otherwise known as the Pacific hagfish. Anisakis pegreffii has also been found in many other marine fish including anchovies, cod, and mackerel, and their final hosts are dolphins. So what's the advantage of using hagfish as a part of their lifecycle? 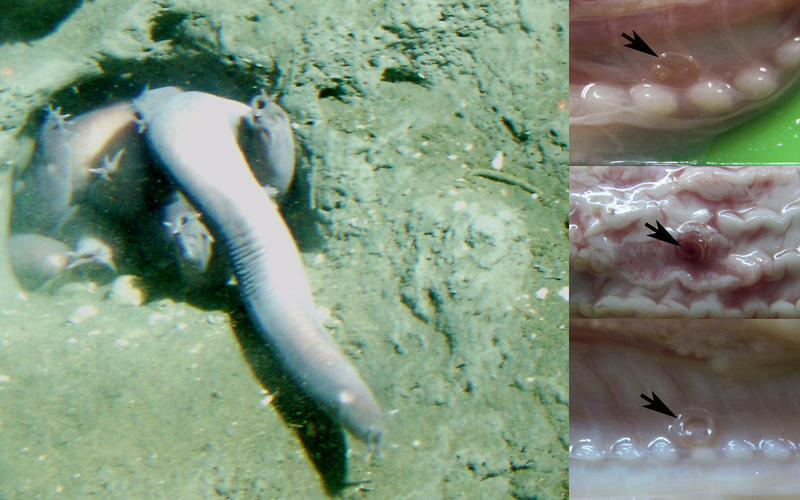 Because hagfish often scavenge on dead fish, they might actually be a slimy saviour for many larval anisakid worms found in those fish. Since the final host of these worms (marine mammals), don't usually go around picking up dead rotting fish from the seafloor, anisakid nematodes in dead and dying host would have usually been consigned to the same fate as their fish host. However, the intervention of the hagfish can keep these worms in circulation, giving them another chance of reaching their final host where they can reproduce. Thus, the scavenging hagfish act as a slimy saviour for these parasites on their life's journey. If you come across a crab which has some kind of kidney-shaped blob sticking out of its abdomen and an extensive network of root-like filaments throughout its body - do not be alarmed - it is merely infected with some kind of body-snatching parasitic barnacle. So let say you then find another crab, of a different species, which seems to have the same affliction. You might think that it is also infected with the same species of barnacle as that first crab. But looks can be deceiving. Parasites vary in the range of hosts that they can infect. Some are generalists that can infect a wide range of hosts, but the majority are specialists that can only live on a few or even a single host species. With the advent of molecular biology, some of those versatile "generalists" parasites have actually turned out to be a bunch of specialists that each infected their own particular host, but they just happened to look very similar to each other. Such is the case with the parasite we are featuring today - Briarosaccus regalis. Briarosaccus is a type of rhizocephalan - a group of highly-modified parasitic barnacles - the most well-known example is Sacculina carcini. As you can see in the photo above, rhizocephalans look about as similar to a seashore barnacle as a haggis. 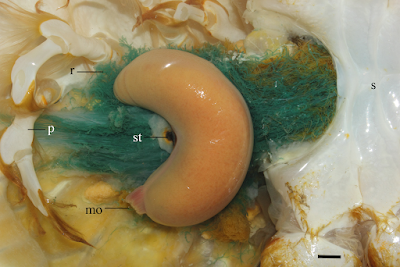 The kidney-shaped orange part is the externa - the parasite's reproductive organs. It might not look like much, but it is capable of undergoing at least 33 breeding cycles, producing up to 500000 larvae each time. The rest of this parasite, call the interna, are actually those luxurious green threads which are wrapped around the crab's internal organs. Not surprisingly, we generally have trouble telling apart what looks like a kidney-shaped blob sprouting a bundle of delicate green roots from other similarly adorned kidney-shaped blobs. This is where DNA can be useful. The new study analysed sections of the mitochondrial DNA of some Briarosaccus specimens from 52 king crabs collected in the fjords of Southeastern Alaska. Previously, the Briarosaccus genus is only known to contain two species, one of which is Briarosaccus callosus which was described in 1882 and has been documented to infect many different species of king crabs, three of which are commercially fished. Since it infects such a wide range of king crabs, it was assumed to be found across all the world's oceans. But the new study that we're featuring today shows that some specimens which have previously been identified as B. callosus actually consist of two other different species - B. regalis which infects the red king crab and the blue king crab, and B. auratum which is only found on the golden king crab. It turns out we've been lumping two previously undescribed species together and treating them as if they belong to another species which we are more familiar with. What this study revealed is that instead of just one species (B. callosus) infecting all kinds of king crabs, there's actually a bunch of specialised parasites which happens to look the same to us. While both B. regalis and B. auratum are found in the same region and their respective hosts occur in close proximity to each other, these parasites are faithful their own hosts. Since there are other plenty of other king crabs nearby, why have neither of them made a switch? Given the extremely intimate relationship that rhizocephalan parasites have with their host - sending delicate roots throughout the crab's body and manipulating their physiology, all without setting off the immune system - they are finely tuned towards their particular host species. So even when there are alternative potential hosts available, neither species can make a switch. From the parasite's perspective, there's no need to do so when your host is so abundant. During their evolution, many parasites have lost physical characteristics which would otherwise allow us to visually distinguish them from their close relatives. Because of that, their differences may not be immediately obvious to us. The use of molecular biology techniques has enabled us to start seeing the true diversity of parasites - most of which are hidden in plain sight. Noever, C., Olson, A., & Glenner, H. (2016). Two new cryptic and sympatric species of the king crab parasite Briarosaccus (Cirripedia: Rhizocephala) in the North Pacific. Zoological Journal of the Linnean Society, 176: 3-14.